The Labrador tea plant grows to be 4 to 5 feet. It will grow up straight in the southern latitudes of the tundra, but in the colder northern latitudes it will creep over the ground forming a carpet. It has woolly branches with narrow 1 to 2 inch leaves which are smooth on the upper side, with rusty hairs underneath. They droop slightly and edges are rolled under, and are a leathery green in color. At the ends of the branches are tiny clusters of white flowers with protruding stamen, which bloom in June and July. rich in vitamin C. They were also scattered among clothes to keep moths away. Branches kept with grain are said to keep mice away. They usually grow in wet meadows, bogs, and forest areas mostly in the lower latitudes of the tundra biome. Bees are attracted to the flowers, but animals don't eat them because they are said to be slightly poisonous. 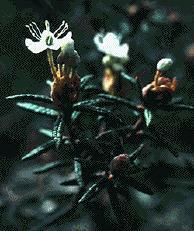 "Labrador Tea", http://www.rook.org/earl/bwca/nature/shrubs/ledum.html, (July 2000). "Labrador Tea", http://www.botanical.com/botanical/mgmh/l/labrad01.html, (July 2000).